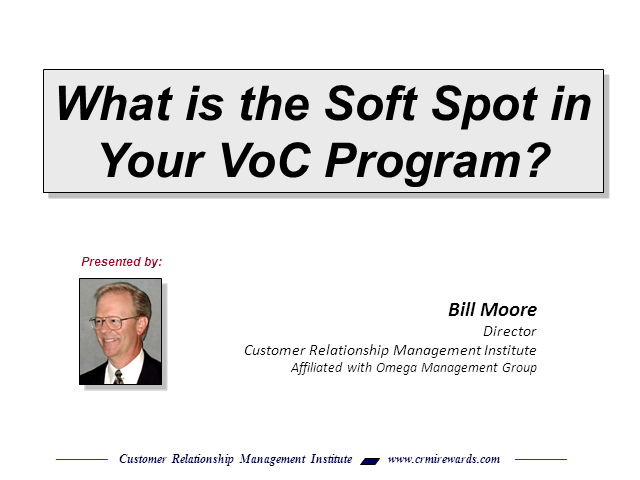 What is the soft spot in your VoC Program? Most Voice of the Customer (VoC) programs focus on getting feedback from the customer and then taking action upon those findings. What is missing in this approach is the engagement, active participation and buy in by your employees. The best VoC program can be the state of the art rocket ship but without the fuel – your engaged employees, you are not going any where! How do you deal with this typical soft spot in Call Center Voice of the Customer (VoC) Programs? Learn about the six (6) key elements that will drive employee participation in a VoC program that will truly result in improved customer satisfaction and loyalty. Join CCNG and Bill Moore of CRMI, a strategic partner to Omega Performance Group for this "hot topic" webcast...and engage with our thought leader / presenter Bill Moore. Title: What is the soft spot in your VoC Program?